There are other posts which you can go through. That could help you to be a Good Batman in Life. Great reminder on how we all come in different colors and we should appreciate others as well as ourselves. The tips are also are encouraging to take care of ourselves inside and out! to take data about my presentation focus, which i am going to convey in college. I am very sorry Ronnie, this beautiful comment had gone into my spam box which I could see it only today. Thanks so much for that. I shall come to your blog and follow you. Please tell me more about your presentation focus in your college. It is not only very good but it feels so nice to look at and that fragrance is felt. I am happy you enjoyed reading it. OMG! Fairness creams, people are mad after that. Once one starts using them it shall be an obsession, the natural glow would have gone and it shall be a must to use them, don’t you think so? By the way you tapped on the great remedies available, the kitchen or home or granny’s remedies. Actually they are the ones which can boost the health of the skin and are cost effective. Same to you too for the year ahead. Oh! Bro! You are from Sri Lanka. I am so happy to know you are so close by. I am from Karnataka. Loved it. If only we humans could rise above color discrimination and not hanker after fair skin, be satisfied with what we have, look after what we have been gifted with today’s scenario would be so different. There would be peace and no wars would have been fought, no colonial rules and no slaves taken in. God had gifted humans with brain which is being used for all wrong things racial discrimination included…. Ranjini! You have fully digested the subject matter of this post, THANKS! What you said is commendable about the gifts God has given. They have always been misused and shall be. Racial discrimination is one we should be ashamed of as humans. But the fact remains…. I shall tell you this is my first post of my blog which I had written for the international audience for the international platform. You can see the date above. I just thought of reposting it or republishing it to make my first post for 2017. Was that a good move ? Yes indeed…nothing better than starting a new page than a reminder of where we are and where should be in future… we still have a long way to go before we can be proud of the fact that we are human race. It is interesting. I had never thought that people with darker skins are wanting to have it lighter. Because the “white” people even go to to tanning studios to get a darker skin! So, in the end we all meet in the middle! Erika! Don’t you think it is so funny? I am surprised how you did not know that. You know these so called creams and the cosmetics are being marketed all over the world. As I say in the post it is not now; since ancient times it is being the style. The “Darpana Sundari” is the proof , hahaha! 😂. Erika I had to tell it that way only because you are also in the beautifying industry. Yes it is true that where you live and in many places of the west it has been a trend past a few decades now that they want to darken the skin by unnatural means. The comments I am getting from some in the west have said about the tanning of the skin and that it so dangerous too. My main purpose of this post was to convey that the original skin color is the one to be maintained, be it White, Black or Brown. I am thinking of writing a new para, edit it and give a sub title. Thanks for your contribution. Oh yes, I got the meaning, Shiva, I just did not know about that bleaching trend. ButI agree: Changing something so profound like the original skin color actually says that the person is not accepting themselves as they are and the root lies a lot deeper. Nice write up. I agree that we need to focus on detoxifying from the inside to look good outside. External creams and chemicals are no good and probably cause more damage. Also its most important to be comfortable in your own skin color! Exactly Yes! The focus is to be done on the inside. Every culture and living methods stresses upon that. You have used that fantastic word detoxify in a the right context. As far as the creams are concerned they are given with that nice fragrance as I have mentioned, maybe that makes one to tempt to use it, don’t you think so? Being comfortable in their own skin color should make one feel good as you say. Your contribution to this post shall hold esteem. Yes you are right …the packaging and marketing of the creams make them so alluring! Fragrances can be tempting! And thank you for appreciating my thoughts! 😃 I did appreciate it a lot. I replied to Ranjini’s comment just now, her thoughts are also contributing very much to this post. You may please see and go through it. I like my people sharing it actively and in good spirits. Indu! I recommend you to read my previous posts and put your esteemed thoughts over there. Please do not mistake me, it is only for your good. yeah sure Shiva. Will do so. I don’t have much time nowadays to browse thru my fellow bloggers’ posts. But will definitely try to check more of your posts. I am currently trying to heal myself thru a natural diet – I have Rheumatoid arthritis and I am in great physical pain. I also want to develop myself more spiritually since mind body healing is what I need! I am so glad to have come across your wonderful blog! Happy New Year to you! I understand Indu. I also can imagine the pain and trouble you are undergoing. But I felt good that you have adopted to natural healing. Ayurveda has better treatments for this. On a personal note I feel you drink a lot of water and do lot of breathing exercises. Yes spiritually you shall be more uplifted. I recommend you certain links of my posts and other links if you are interested. You may email me if you want. Only if you are interested I shall give you my email address. This body is meant to give some or the other pain you see! thanks Shiva! I did try Ayurveda in Kerala this summer and continued taking ayurvedic medicine for two months but somehow didn’t work for me. So I am trying naturopathy now. Yes I would love to get recommendation from you for your posts that I need to read. Let me know your email id and I shall email you. Many thanks! Indu! First let me tell you one thing, make sure a third or fourth time because normally all take one or two opinions, whether you have that. You have gone for the naturopathy which is the best. I feel you drink four to five litres of good clean purified water. By that any other ailments also disappear. As for the links I shall send you soon when I am on my desk top. Tell me do you use more of your PC or smartphone to communicate on the blog, that also makes a lot of difference. For fast and regular comments the phone is best but to know of the bloggers look I recommend one should use the PC. I shall tell you few more things of Pranayama if you want from the mail. My email is my name continuous all small letters @gmail.com. So do mail me now. Just wrote to you. Looking fwd to getting ur tips. I shall send you a detailed mail, please give me some time. I have already seen your mail just now. No problem. Take your time! No need to whiten or darken your natural colour. What you are born with is what you are, and one is beautiful when they are comfortable in one’s own skin – not trying to be something that one is not! All chemical and artificial alterations make one UGLY!!! Makeup / cosmetics are meant to ENHANCE one’s beauty, not cover it! You speak some truths here, but I bristle at the lie that “white is right.” Being pale is meaningless…especially if one isn’t born pale / albino! Very well said Make up /cosmetics are meant to enhance one’s beauty. In the act of beautifying the purpose is lost. Yes they should learn to be comfortable in one’s own skin that is the intention of this post. I am thinking of editing this post throwing light upon the comments that are coming in a nutshell and give a sub-title to it. Thanks for your valued contribution. Somehow I feel that it is the glow of a face that is more attractive than the colour of the skin. That glow has a calming and soothing effect on the observer too. This is more pronounced in the case of very old people, some of whom have very sweet and radiant faces. I think it is mainly the result of mental peace and harmonious life. Very well said Amit! Why some how Yaar it is very very true. Your observation of the old people is a fact to be adored and get the inspiration. I always keep telling that; what type of life one has lead reflects on one’s face and skin. It is very evident. 😃 Thanks so much Dear friend. Your comment brightens it more. Thanks Maureen I did have a restful sleep. Yes people in the west have taken to this fad of darkening the skin by tanning methods. It is so dangerous to do, as you have said it. I am feeling to edit this post, write a para of these things and give a sub title. 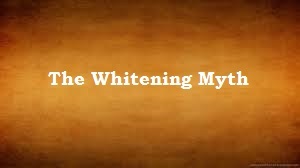 The title of the post I think should have been The Whitening and Darkening Myth. Hahaha. I am happy so many bloggers are contributing their thoughts here. I will write a gist of the comments that have come forth. My absolute pleasure dear Shiva! yes a post to show that there are two sides to the coin so to speak! Great idea! XO! I am smiling..this ia really timely..as whitening has become a fad all over the world.. Thanks for your valued contribution Mich! As others have noted here, those of us who are pale want to be tan. I have always wished I had what we call here “olive” skin as it seems more even and goes well with clothing. Being too white is a problem and those of us with Northern genes tend to burn in the sun, which isn’t very good either. Oh! Olive is another type I didn’t know. I understand now it should go with the clothing too. To give you a surprise, the brown skin we Indians say we have does make slightest differences from region to region which we can make and get to know, though we differ by a few kilometres away from each other. This is Amazing don’t you think so? I am happy all agree to have it the natural way. Of course that color of the skin has come due to the living in those areas for centuries, isn’t? Shiva, you are a genius. To write something so descriptively on a sensitive topic ‘Skin’ requires patience and intellect. I liked the way you showed the varieties in skin colour. The natural way of whitening and staying healthy was informative and useful. Good informative article Shiva. Thanks so much Anoop for the praise. I had done one more and that was my second post on my blog, two years back. I am inspired by your comment. I was thinking of republishing it again. Today I have done it after some editing and have given some links too for people like you to study, go ahead and read – “IN THE PURSUIT OF BUSINESS”. Yes this one also is descriptive and sensitive, coolly to be thought over. I have yet to reply to your other comments which I shall in while from now. Sure Shiva. I’ll read the republished article. 😃 That was a very frank opinion. A will to connect regardless of our skin colour, religion, race and hair is commendable. Your comment here shall hold so good and an inspiration to others who shall read this post Wendy! Short, Sweet and Apt Brigid! I love where you wrote that maybe the mirror is bored looking at you..ha that was hilarious. Funny, being white I have invested in tanning agents so as to give myself a tan and not be so white. Especially now since they say lying in the sun can cause cancer. But you are so right about all of the items we use on our face, mostly women, to keep wrinkles away, to keep it moistened, foundations, eyeshadows, etc. We should all take your advice above and have healthy skin the natural way! 🙂 Great post!! Go read the “I Cease to See” you may enjoy that also Hema! Now that I’m older I’ll be 58 next month I’m very grateful for my Dark Skin because I don’t have lines or wrinkles. Most of the time I’m mistaken for being in my 30s or 40s despite the fact that I’m almost 60!! I vote for what Dad said. I just adorn the Black skin for many reasons. As for me it is the same with me people mistake me to be so as like yours. I am just two years older to you. And always feel I am in my twenties. Amen Brother Shiva!! Now we just need to educate more people of Color both Black and Brown to Celebrate all that Melanin that God gave us!! Grace & Peace!! DeBorah! Your name is DeBorah is it. Yes we should. Skin the most superficial layer of our body as mentioned in the post makes such a helluva difference in the thinking. I am blessed to receive your graceful and peace blessings, thankyou so much DeBorah!